You can campaign for or against and the law banning campaigning on election day applies to not only common mortals, but also to narcissistic personalities caught up in their presidential powers. It was said about President Rolandas Paksas that by breaching the law, he shamed Lithuania. If it were decided that by openly becoming involved in electoral campaigning, President Grybauskaitė did not break the law, such a ruling would be shameful. It would show that the law in Lithuania is either selective or that all officials can publicly criticize candidates on election day. Unsolved presidential election mystery: who will Matijošaitis‘ votes go to? The head of state and those thinking similarly criticizing one of the leading candidates in the presidential elections, if we take the criticism out of context, is not inherently bad or unacceptable. A fierce discussion is ongoing and that is laudable. Skvernelis' tone is also militant. He escalates the situation himself, firing arrows at sensitive locations. However, if we do not sever ourselves from the context and compare these presidential elections with prior ones, we would see a clear contrast. President Valdas Adamkus did not attack candidates during the 2009 presidential election campaign and furthermore did not campaign when it was prohibited. The leading candidates in 2014 were much more unremarkable and their campaigning much blander. 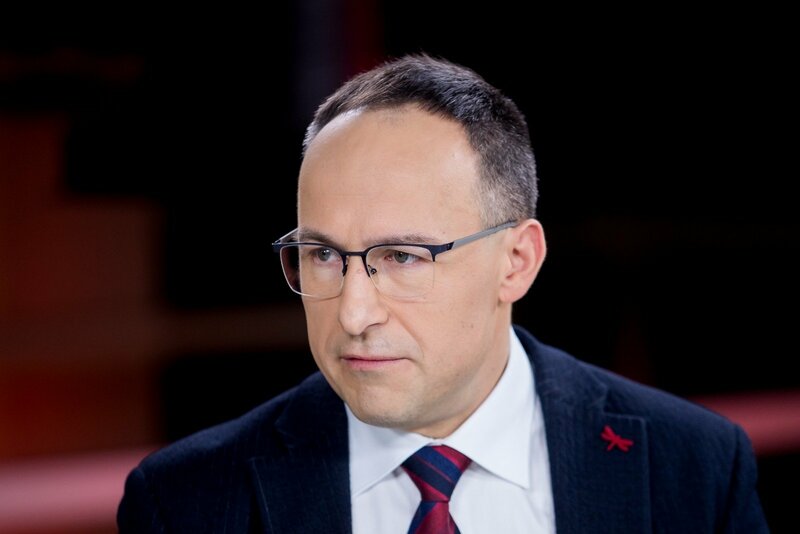 The main rival to Grybauskaitė – Zigmantas Balčytis was unable to draw any attention worthy ideas or statements from himself through the whole campaign. The main point he made was that Grybauskaitė is a good and hard to criticise president and he is only participating in the elections not because his policy would be better in any way, but only because it is "no longer her, but his time." Only candidate Juozas Petraitis, who in 2003 campaigned under the slogan "I am a person, I am in favour" exceeded Balčytis with the lack of content. But unlike Balčytis, he was not viewed as a contender. The campaigning in 2014 was incredibly banal: the two main rivals entered the second round having practically not said anything critical to one another or anything meaningful. The choice was as if between two mute manikins sporting clothes of the same style and fashion brand, not between two politicians with things to say. Today the situation is much better than five years ago. All three leading candidates are much more meaningful alternatives to the favourites of 2014. In these elections, Grybauskaitė's main opponent from the centre-left Skvernelis is a whole head above her previous opponent Balčytis. Take even their foreign policy programmes: they differ like day and night to Skvernelis' advantage and Balčytis' disadvantage. Meanwhile, Gitanas Nausėda and Ingrida Šimonytė are simply intellectuals compared to President Grybauskaitė. They are intelligent individuals next to the bureaucrat "fighting her small wars." They read books and use improvisation when speaking, drawing from their solid cultural background. She speaks by answering predetermined questions, drawing from a completely different experience and rumours. Of course, there is basis to criticise Nausėda, Skvernelis and Šimonytė. However, they, unlike their predecessors in the presidential elections, are at least interesting as political personae. You can disagree with them, you can notice their political weaknesses, however these elections are a good opportunity to celebrate: we finally have a normal choice. A choice between personalities, not talking manikins. What is shameful is that moods in the public sphere now and in 2014 nowhere near match that time and these days' contrast. There was serious basis for discontent, scorn and sarcasm five years ago when a truly abysmal election was held. However, it was then that the public sphere was somehow calmer and better intentioned. One candidate is now described as "Grybauskaitė's clone" and "Conservative lackey" despite her clearly being too intelligent and independent to be a clone or lackey. Another candidate is shamed though shame is actually emanating right from where it is being called out. If Grybauskaitė were to have a look at her 2009 electoral programme, she would learn that there are things to learn from the shamed candidate. The third candidate is in hot water with the parties because he is overly independent and furthermore is taking votes from the electorates of both his rivals. But perhaps this is not his problem, but that of the parties supporting his rivals? If there is such a thing as a state of consciousness, then stupidity is a state of unconsciousness [state of nonsense]. Nonsense often emerges in politics when failing to do homework and failing to drag one's statements into reality, one takes up primitive and detached from reality propaganda. The examples of such propaganda and nonsense is some party leaders' claims of victory following the municipal elections. We can all see just fine that victory in the elections went to the committees and not the parties, but we are hearing what the imaginations of those, who didn't win, dictates. The Conservatives talk about victory following their dramatic failure in all three major cities. The party aiming at educated, higher income citizens, the concentration of whom is the greatest in the major cities, lost exactly where it was aiming. Becoming a party of the regions is victory? The Social Democrats are also celebrating victory, forgetting to clarify that the good results are not the achievement of the party or its chairman, but the autonomous achievements of popular regional leaders. Social Democrat chairman Gintautas Paluckas, with only 0.5% of the vote in the Vilnius mayor elections and even losing the small number of Vilnius council member seats, has lost his modest post of vice mayor and is now no longer in any elected office. A very peculiar archetype of the Social Democrat "victor" and "leader" is forming. To crown this absurd tragicomedy there's the Presidential Palace's "political science". President Grybauskaitė's representative declared that the opposition won the elections. Since it was the municipal, not the Seimas elections, one need only look at the three major cities to see that such a claim is close to nonsense. It was the incumbents that won in Vilnius, Kaunas and Klaipėda. Thus, perhaps the president, saying that the opposition won the elections, was simply celebrating the "Farmer" victory in Lazdijai against the region's longstanding government? One of the greatest absurdities during these municipal elections were the propagandist election evaluations, emanating even from relatively sane politicians. Perhaps these politicians do not believe in people's ability to adequately grasp reality. And in this regard, they are similar to Russian brain-washeries, fighting "their little wars."